The party is over and I am perfectly satisfied. I got to make all the things I wanted to and it turned out just like it did in my head...which is always a bonus, and Q was head over heels for all of the sock monkey items. 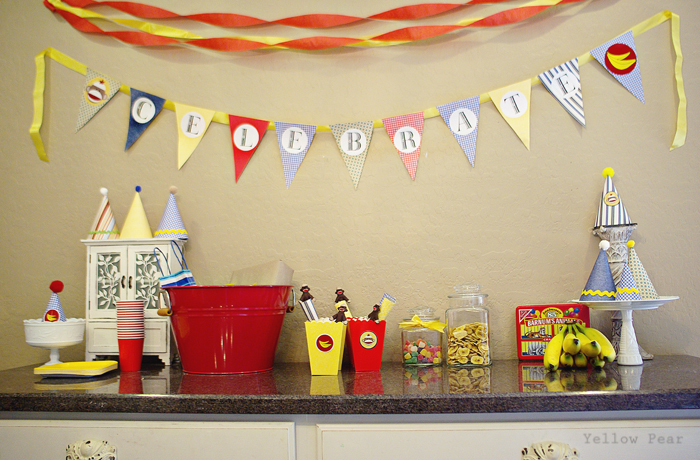 I love thinking of party details for weeks whilst I am scrubbing toilets/floors/dishes. It lessens the monotony. I made a digital sock monkey for the invite (really just an announcement for family) and decor all.by.myself in Photoshop and couldn't believe I actually pulled it off. Q walked by and noticed it immediately as a sock monkey which was the ultimate in validation. I also designed the card in Photoshop and wanted it to mirror the party with a simple vintage, whimsical feel with yellows, reds, blues and a mix of stripes, and polka dots. I also made these tiny felt sock monkeys for party favors out of.... well, felt....and pipe cleaners and stuffed them with cotton balls. The pipe cleaners make them bendable. They were really fun to make and only a tad tedious! I found these lovelies at one of my favorite thrift stores for $4. Steal. Q loved the banana chips until he discovered the gumdrops...typical. I stumbled upon an unused birthday party set of hats and kazoos at another favorite thrift store for a dollar and bought them directly. I then had an aha moment and covered the hats with scrapbook paper and odds and ends I had in my stash ( I love ric rac). I did the same with the kazoos. It was a beautiful thing. Making hats from scratch is mucho harder...and I don't even know how to make kazoos from scratch. I also printed off some extra digital sock monkeys and bananas at my local lab to use for any embellishing. 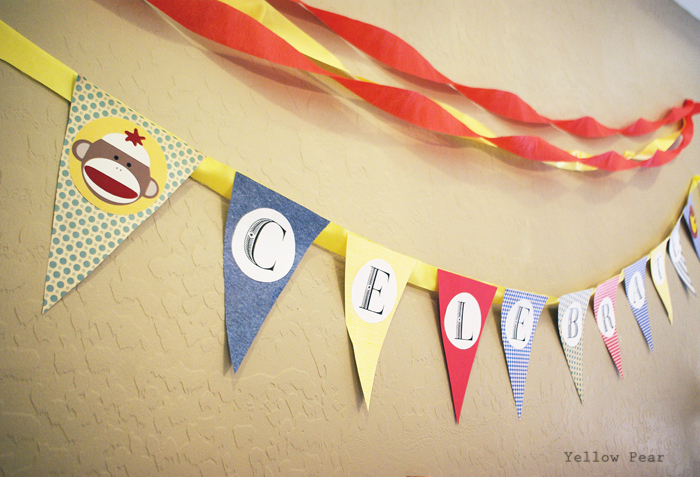 I made a banner with leftover scrapbook paper, ribbon I had at home, "CELEBRATE" letters I printed off (using Photoshop), and a larger digi-monkey and bananas for the ends. I bought the party favor boxes in red and yellow from Walmart and attached some of the bananas and monkey circles to tie them in to my theme. I filled the boxes with butterscotch candies (just because they were yellow), kazoos, and the felt monkeys. 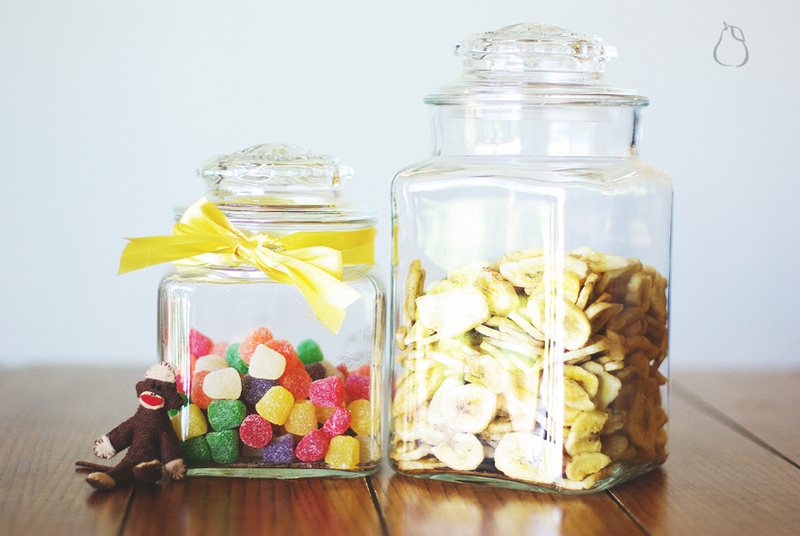 Guests could also add gumdrops and banana chips to their boxes to take home. I picked up the Barnums's Animal Crackers tin at the thrift store as well, since it went along with the vintage feel. We didn't plan a lot of organized games, as the guest of honor was barely two. 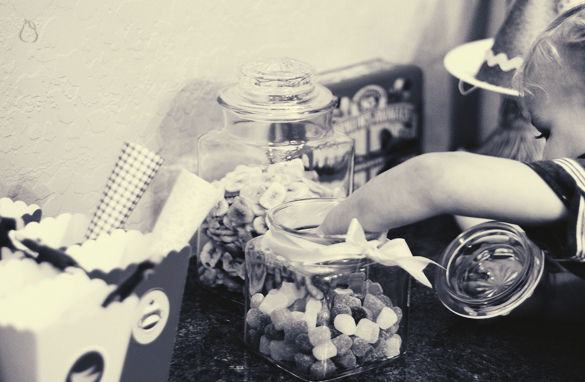 Instead we invited a family over for dessert and let the kids run around, blow their kazoos, play hide and seek, eat treats, wear their party hats in all sorts of crazy ways and just enjoy general merriment. 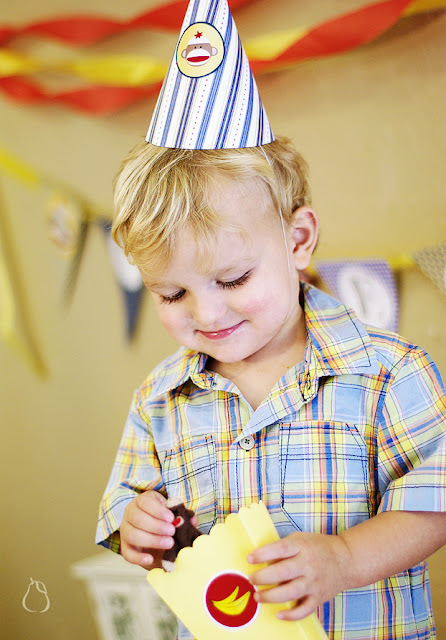 Q couldn't figure out what to do with the candles on his cake (bars)...but he really enjoyed opening his presents. I made him a memory game because I had to use the monkey at least one more time. 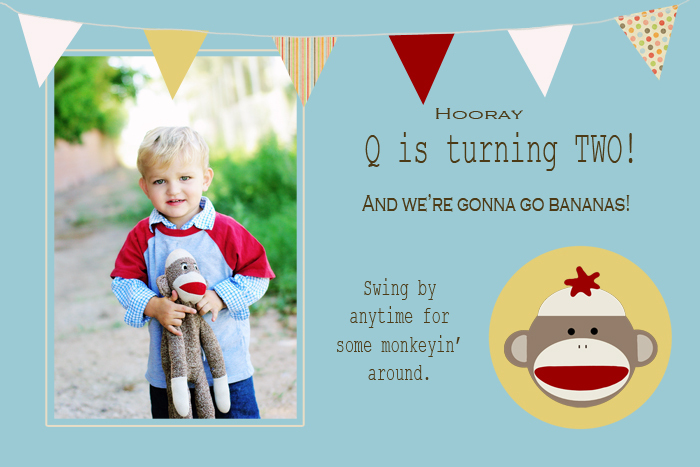 I just printed off 4x6 prints of the monkey and other shapes and vintage-type clipart appropriate for young boys and especially images I thought Q would recognize as well as one with his name. Some of the images I found from free clipart websites, some I drew in Photoshop and others were shapes that came standard with Photoshop. After getting the 4x6 prints, I glued scrapbook paper to the back, laminated them all and used a rounded corner punch to round the edges. The kids really enjoyed playing the game and matching up all of the pictures....which made me happy after all that hard work. And just like that he was two. You're the most amazing woman! 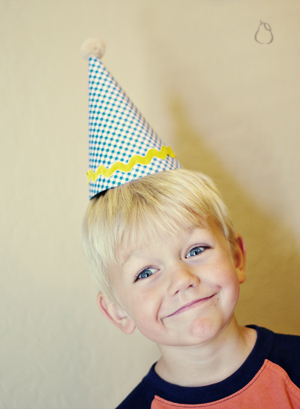 What am I going to do for MY child's birthday?? He's not even going to BE here, but I can't let the day just pass like it's just another day. And it's on Sunday. Lou, do ya have ANY genius ideas you could lend me?? Where did you get those fun squiggly candles? How about if you make one of those memory games for my child and I'll pay you for it?? -Parts AND labor. :) Whattaya say?? Oh my goodness, so adorable, love the monkeys and the colors. 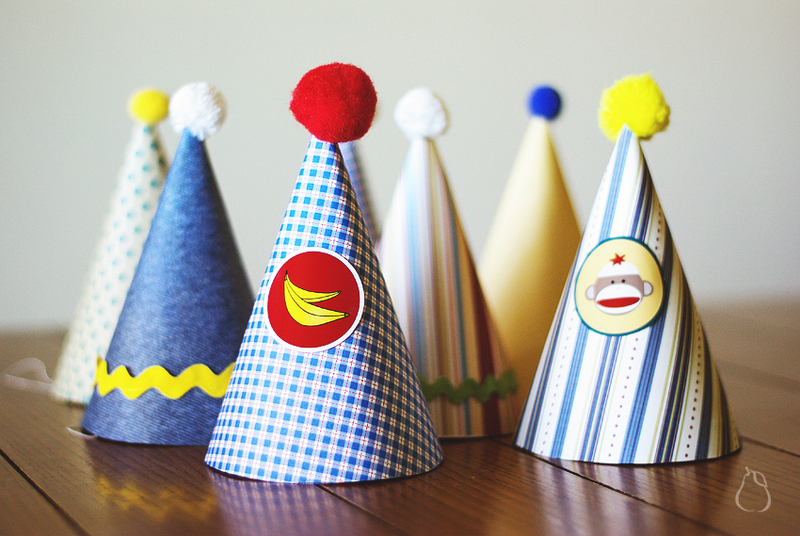 Already 2 years old, where does time go..
Love it all...the felt monkeys, the party hats, the banana chips! What a splendid party! 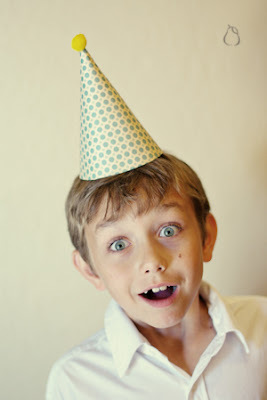 Great party photos! Thank you for sharing. Your decorations turned out great! 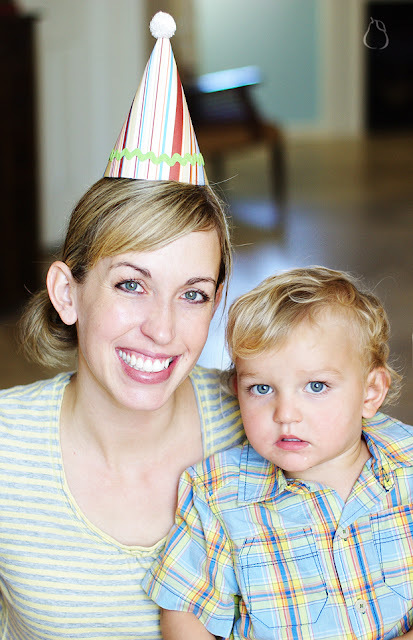 What a cute idea for a party! Can he be two already? Wow. Your parties belong in magazines....they are to die for cute!! 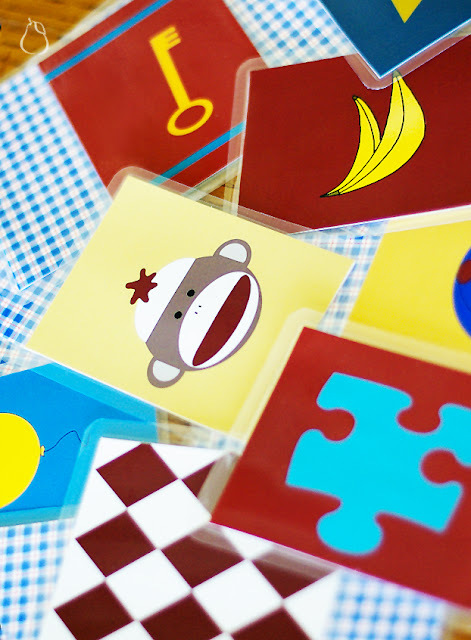 I love the monkeys especially....and the memory game! 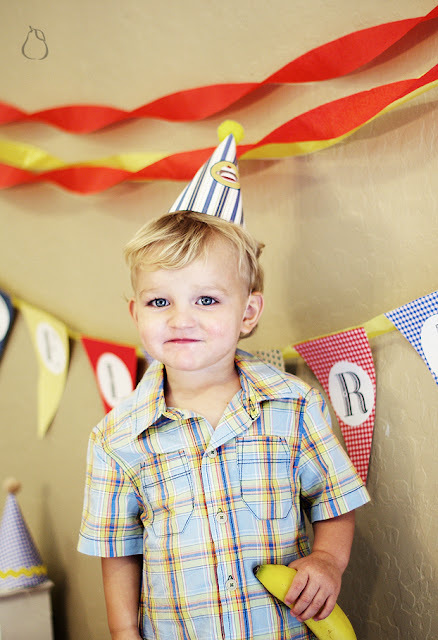 What an adorable theme for your adorable little boy!! Oh my E, that is amazing. You did a fantastic job. I think Rain got the short end of the stick on this bday party. Maybe when you're here this summer we'll have to have a half bday party to make up for it. Great party. 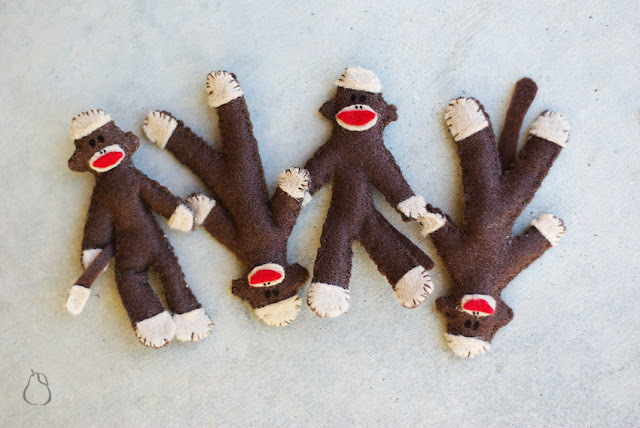 Those sock monkey favors are fantastic! this party is precious! 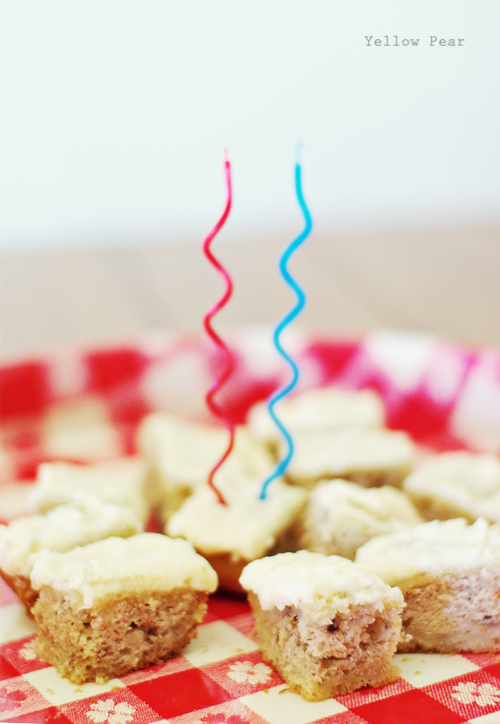 love all your little details...banana chips were a perfect addition! I'm super impressed with the detail that you put into this party! With what is not appreciated now in their early life will be treasured when they are older! I love all the colors! So cute!!! I loved the little felt sock monkeys. I loved all of your great photos. 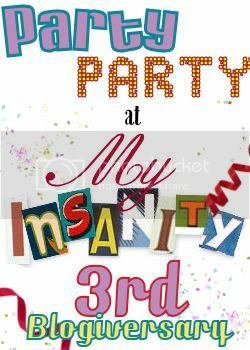 Coming from My Insanity.